Melissa Drerup is pictured with her dog, Diesel, 6, behind Tractor Supply Company and Auto Zone in Ottawa, an area where she is proposing a dog park be located. OTTAWA — Putnam Pet Pals President Melissa Drerup wants a dog park in Ottawa where her dog and other dogs in the community have a place to run in a fenced area. Drerup attended Monday’s Ottawa Village Council meeting to request the village donate the land behind Tractor Supply Company and Auto Zone for the park and also requested a dirt mound that is at the site to be moved closer to the property lines. She presented her proposed plan for the dog park during the meeting. Drerup said she will need to get approval from TSC for an easement that would allow right of way to access the property. “We love the location because it is easily accessible and highly visible and patrolled by residents and police,” Drerup said. The cost to fence the property would be $25,000 to $35,000. There would be separate areas for small and large dogs and users would pay a fee and be issued a key fob to get into the park. There would be security cameras to monitor the park. It would be the same cost for members dogs to enter regardless of the number of dogs owners bring to the park. Park users would be required to sign off on a waiver and provide proof their dog has immunizations. “My property is not fenced and I have a 75-pound dog and there is nowhere around here where I can let my dog off the leash to run and get exercise,” Drerup said. Putnam Pet Pals conducted a poll on its Facebook page and there were 4,300 views of the poll with 250 who responded, and 235 people were in favor of the dog park. There would need to be electricity at the site for lighting, the key fobs and security cameras and water lines at the property. Stone would need to be brought in for the parking lot area and trash removal with a supply of dog waste bags would be other items needed. Drerup said Putnam Pet Pals would be responsible for the maintenance of the park and would need to find a professional mowing crew and snow removal company to provide upkeep of the property. Mayor Dean Meyer said he supports the idea of a dog park in Ottawa. “When I heard about this I thought it was a good use for the ground and the village would not have to mow the property,” Meyer said. The city will check on the cost to move the dirt and get back to Drerup on her proposal. David Michel, council president, said he also supported the park, but would like to check with neighbors to make sure they support the proposal. “I have been to dog parks in Columbus where it was free to get in and there were separate areas for large and small dogs, and they are nice,” Michel said. 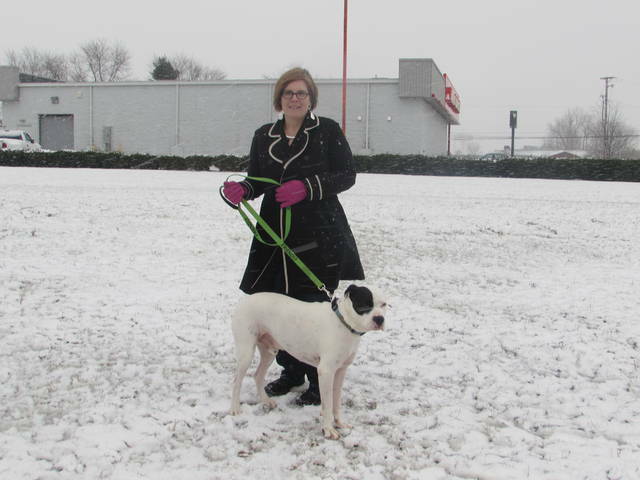 https://www.limaohio.com/wp-content/uploads/sites/54/2018/11/web1_IMG_1741.jpgMelissa Drerup is pictured with her dog, Diesel, 6, behind Tractor Supply Company and Auto Zone in Ottawa, an area where she is proposing a dog park be located.